I've written several times in the past about people who speak to Ashley and then get frustrated because she seems to ignore them. I refuse to put a sign on her saying, "I am deaf", so I have decided to share some myths about deafness. You will notice that I left out the obvious myth - "People who are deaf can actually hear sometimes!" Some hard-of-hearing people have enough residual haring to talk on the phone. People who are deaf often use a device called a TTY and a state relay system for phone line communication. MYTH: People who are deaf are also mute. It is incorrect to assume this. Some may choose not to use their voices if they think they will be difficult to understand or have inappropriate pitch or volume. In any case, terms like “deaf and dumb” or “deaf mute” are considered offensive today. MYTH: Unusual sounding speech means a person has mental retardation. 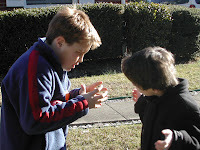 Speech development depends greatly on one’s ability to hear himself or herself talk. For the person who is deaf, the foundation for learning speech is not there. It has nothing to do with intelligence. Lip-reading is a skill that some deaf or hard-of-hearing people have. Others do not. Even with the best lip-readers, it is important to remember that only about 25% of speech is visible on the lips. Some words look almost exactly the same – for instance, the words “battle” and “paddle”. Hearing aids are assistive devices which improve hearing for some individuals. Hearing aids do not “correct” hearing. A hearing aid may enable a person to hear someone’s voice, even though she or he may not be able to understand distinct words. Just because someone wears a hearing aide does not mean the person hears normally. MYTH: People who are deaf are not very bright of educated because they have not learned to talk or do not use proper English grammar.The primary language, or first language, of the Deaf Community is American Sign Language. English is a second language. Most deaf and hard-of-hearing people learn English usage and have speech training, but naturally enough they may find it easier to use their primary language most of the time. MYTH: People who are deaf lead totally different lives from other people. Today, my every thought and prayer is with my friend, Lynnette and her beautiful daughter, Brooke. Brooke is scheduled for surgery today – a tracheotomy. A tracheotomy is a surgical procedure that creates a temporary or permanent opening in the trachea. Brooke’s tracheotomy will create a permanent opening and it will help with her breathing problems. Brooke is only 9 years old and is dual sensory impaired (deafblind). She has been through a lot in her 9 years, but she has faced each challenge head on, and reigned triumphant in spirit. Her smile is contagious, and everyone around her can’t help but smile also. Her laugh is to me the laughter of angels – so pure, so honest, so happy. There are no words to describe how difficult it is to be a mother and have to make a decision such as this. Brooke’s entire quality of life is going to change – some good, some not as good. Mothers already have so much to shoulder when it comes to raising a child, and it seems almost unfair that they would be faced with these kinds of decisions. But we are – every single day. The only way I can personally make sense of that is to believe that God knows that we mothers are strong enough and wise enough to handle the decisions. So Lynnette and Brooke, today I will be praying – for a successful surgery, for an easy recovery, for Brooke’s understanding of her mother’s love through all this, and for Lynnette’s peace of mind that she has made the right decision. Both of you, take time to heal and time to grow even closer as mother and child. I love you both. Systems change – a term that is being tossed around by a great many government agencies and organizations that support people with disabilities. The term seemed to rise in popularity about 6-8 years ago. The first thing I noticed was that organizations which once provided a great deal of hands-on, individual support backed away from that support. They began talking the language of strategic planning, technical assistance, and outcomes. Families and people with disabilities were taken by surprise by this shift, primarily because they were given little or no explanations. An even more disappointing aspect of the shift is that in the 6-8 years it has been in vogue, I have seen no systems change. In concept, the idea of systems change starting at the top of the service paradigm sounds good. In practice, it hasn’t been so good. However, trying to effect systems change from the bottom – a grass roots effort – is too slow and too draining for families and people with disabilities to sustain the effort for the length of time needed. I’ve found through my own efforts that sometimes litigation can effect systems change, but usually not on the scale that is needed. So what’s the answer? I believe the answer is the development of an innovative, completely different model. I don’t know what that model is yet, but I had lunch today with someone who does. The ideas presented were intriguing. And even though these ideas will take some time and refinement, the difference to me is that they offer hope – hope for a meaningful life for my child, and many other children, with dual sensory impairments. Until today, my week had been depressing and disappointing. I am facing the ever-present school and insurance battles. I am still struggling to raise my children well, and ensure that their needs are met. I am still worrying what the future holds for them and for other children with disabilities. But now, mixed in with the worry, the struggles and the battles is hope. I will share more about this new model when the time is right. But that time is not now. Until then, I will be recruiting families who I believe are ready for a change, and ready to commit their time and energy to that change. If you are one of those families, and you have a child of any age with dual sensory impairments, please contact me. If your family is in need of hope for the future, and you want to work towards making that hope a reality, I need your help and am anxious to hear from you. Thank you, Tim. I am excited about the future of the plans we discussed today, and I am ready to assist in any way I can. Forty five years doesn't even begin to be enough punishment for this man. 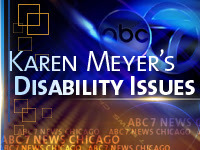 Today marks the 17th anniversary of the signing of the Americans With Disabilities Act. On this anniversary, I believe we should evaluate the progress we have made and commit ourselves to continuing the fight for equality. Justin Dart, renowned disability rights advocate who passed away in 2002, is considered to be the father of the ADA. Below are his comments on the signing of this landmark legislation. President George Bush signed the Americans with Disabilities Act on July 26, 1990, a landmark date in the evolution of human culture. Throughout all of reported history until recent decades, people perceived as having significant disabilities have been treated as sub-humans. At worst they were killed or left as beggar-outcasts to die, at best they were cared for through subsistence welfare, out of sight and mind in institutions and back rooms. With the development of modern medicine and social responsibility, millions of 20th Century humans are surviving previously fatal conditions and living on with significant disabilities. These individuals have a great potential to be happy, productive members of their communities. However, our best efforts to fulfill this potential have been consistently limited by a massive residue of prejudice and paternalism. Our society is still infected by an insidious, now almost subconscious assumption that people with disabilities are less than fully human, and therefore are not fully eligible for the opportunities, services and support systems which are available to other people as a matter of right. More than two decades ago many of us in the disability community concluded that Americans with disabilities would never achieve full, productive citizenship until this nation made a firm statement of law protecting their civil rights. The Americans with Disabilities Act is such a law. It establishes a clear and comprehensive prohibition of discrimination on the basis of disability. Taken in combination with previously existing disability rights law, it provides a sound legal framework for the practical implementation of the inalienable right of all people with disabilities to participate equally in the mainstream of society. It extends to people with disabilities the same protection of their rights that is already enjoyed by the members of all other minorities. Most importantly, ADA is a landmark commandment of fundamental human morality. It is the world's first declaration of equality for people with disabilities by any nation. It will proclaim to America and to the world that people with disabilities are fully human; that paternalistic, discriminatory, segregationist attitudes are no longer acceptable; and that henceforth people with disabilities must be accorded the same personal respect and the same social and economic opportunities as other people. ADA opens the doors of opportunity for millions of isolated, dependent Americans to become employees, taxpayers and welcome participants in the life of their communities. It prepares the way for the emancipation of more than half of a billion of the world's most oppressed people. I am proud of America. I am proud of President Bush, Attorney General Thornburgh and Boyden Gray. I am proud of Senators Harkin, Hatch, Kennedy and Dole. I am proud of Congressmen Hoyer, Owens, Bartlett, Mineta, Fish, Brooks and all the great members of Congress who supported ADA. I am proud of former members Lowell Weicker and Tony Coelho. I am proud of Bob Silberstein, Bill Roper, John Wodatch, Melissa Schulman, Bob Tate, Maureen West and all the great Congressional and Administrative staff who authored and fought for ADA. wilderness of prejudice and paternalism for the victory of ADA. Once again America has passed the torch of liberty and productivity to the world. All who love justice must unite in action to protect our hard won ADA rights, and to ensure that they are implemented through strong regulations, and enforced in every community. private sector to ensure that all will profit. But ADA is only the beginning. It is not a solution. Rather, it is an essential foundation on which solutions will be constructed. We must undertake a courageous reallocation of our society's resources from paternalism to independence and productivity. We must invest in a continuum of new and strengthened programs to liberate people with disabilities from dependency, and empower them to be equal and productive participants in the mainstream: Productivity-oriented education for all citizens. Economic, technological, independent living, vocational rehabilitation, transitional, personal assistance and community based supports for productivity and quality of life. Prevention. Affordable insurance and health care for all. Incentives for productivity to replace disincentives. Accessible communications, transportation, housing, and completely new communities that are accessible as a whole. A large agenda? Certainly! But no larger than that which faced our patriot forefathers at the successful conclusion of the revolutionary war. I believe that we will unite to fulfill that responsibility. Because I believe in you, the patriots of ADA. And I believe in you, the patriots to be. Together we have overcome. Together we shall overcome. People like Dave Hingsburger at Chewing the Fat who likes the idea of expressing thanks publicly and has challenged his blog readers to do the same. Thanks, Dave! 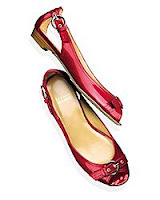 Red patent leather peep-toe shoes which lift my spirits when things are looking bleak. I’m wearing them today. That I was able to get to work and my parking space without too much trouble from the Michael Vick court date circus – the courthouse is right across the street from my office. That for the last week, Ashley has slept about 6 hours each night – not straight through, mind you, but it’s much better than the usual sleep patterns. That my rubekia flowers are in full bloom and add shots of brilliant yellow/orange color to my yard. And, that they are not poisonous to eat since Ashley has 3-4 each day. That I haven’t gotten any calls from my daughter, Jessica’s day support program to inform me of yet another incident of aggressive behavior. It seems like some people expect children with disabilities to be better behaved, have fewer outbursts, or be better disciplined than the average child. I’ve written on this subject previously in a blog entry on compliance. In that entry, I focused on the classroom and how children with disabilities were held, in my opinion, to higher standards than their non-disabled peers. But I’m seeing it more and more in other settings also. On my daughter’s school bus – a bus which transports only children with disabilities – the children are expected to stay in their seats and face forward. Many of the children are harnessed in so they can’t move, but for the ones that aren’t, the bus driver and aide frequently yell at the children to sit down and face forward. Have you ever seen the school bus for children without disabilities? Kids are moving all around, leaning across the aisles, yelling to their friends, playing on their computers, and throwing paper balls. The bus driver on that bus just turns her radio up louder. In the group home in which my oldest daughter lives, the staff often complains about how grumpy their charges are, how they don’t smile or laugh much. Well, if I was told when to eat, what to eat, when to shower and dress, and when to go to bed, I’m not sure I would be happy and bubbly all the time either. Just because our children have disabilities, it does not mean they don’t have feelings and emotions. I have bad days when I just want to be left alone. My kids have bad days when they just want to be left alone. People with disabilities should not be held to any higher standard than people without disabilities. However, given what a lot of people with disabilities have to deal with on a day to day basis, I’m surprised they are not more rebellious than they are. I bet I would be. I’m not a Stepford parent and I don’t want any of my children, with or without disabilities, to be Stepford children. forming an exception or rare instance; unusual; extraordinary: The warm weather was exceptional for January. unusually excellent; superior: an exceptional violinist. b. being physically or esp. mentally handicapped to an extent that special schooling is required. having exceptionally high intelligence: gifted children. So, being special means being exceptional. And gifted means having a special talent. And exceptional means being gifted. Umm, if the terms are pretty much interchangeable, then why is there such a disparity in how the terms are used as labels in our school systems? In my school system, having a gifted label means the student is extra smart. Those students are taught in challenging classrooms and exposed to many different teaching techniques. They go on different field trips – more intellectually stimulating ones. They are strongly encouraged to take part in intellectually-slanted extracurricular activities – things like the Chess Club, Destination Imagination, and Knowledge Master competitions. Having a label of special or exceptional, however, means the student is one of the lost. 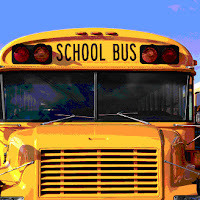 Special education or exceptional education students often are not included in field trips. It is rare to see a student with one of those two labels even participate in extracurricular activities, much less have the opportunity to participate in intellectually stimulating after school activities. Often these students are further classified by such terms as learning disabled, educable mentally retarded, trainable mentally retarded, emotionally disturbed, and severely and profoundly retarded. The majority of students with any of these labels are often not taught with any approved curriculum, but rather spend their days working on functional skills such as toileting and handwashing or going on community based instruction trips to the mall or bowling. Gifted education students are encouraged to explore and learn in many different ways. Exceptional education students, most often without encouragement, explore and learn in many different ways. Wait a minute, does that mean both these types of students might actually be learning the same way? Does it mean that the same supports and encouragements will make the learning experience successful for both these groups? My goodness, I believe it does…. I took on the job of mother with my eyes wide open, knowing that there would be difficult times mixed in with all the rewarding times. While the media and even other parents are quick to talk about all the good things involved with parenting – seeing your child’s first smile, their first steps, the fun birthday parties, the graduations, and watching your children turn into fine adults – very little is shared about the difficult things. And, one of the most difficult is caring for a child that is seriously sick or injured. Stephanie, at Greek Tragedy, a first time parent of premature twins, is struggling to maintain her sanity while her infant son endures surgery to have a shunt placed in his brain. Although to most observers she is doing a fine job of balancing the needs of her family while caring for her son, she feels she is “a mess”. In fact, her son is probably coping and healing better than she is. As mothers, we tend to question our every action and worry about the results of those actions. If a mother doesn’t, she is viewed as cold or less competent, when the reality is that we all have different ways of handling the extreme stress of caring for a sick child. My friend, Lynnette, whose nine year old daughter is facing surgery to insert a tracheotomy tube, seemingly can go and go like the Energizer bunny with very minimal amounts of sleep. I can hear the worry and exhaustion in her voice, yet she still focuses on the positive. Just this morning she wrote me, “Everything we've been through has made us stronger and more appreciative of the gifts of life; I know this will be the same - in time”. Now there is the mother lode of strength. I, on the other hand, turn into even more of a control freak than I usually am when one of my children is in the hospital. I expect medicine schedules to be followed, beds to be changed as needed, nurses and doctors to be pleasant and to share with me every detail of what it being done to my child. I demand to know what the professionals are thinking and why they are thinking those thoughts. If the hospital food is not to my liking, I will bring in food I know my child will eat. In short, I know the hospital staff is really, really glad to see my child leave the hospital because it means I will also be leaving. My Ashley is facing brain surgery, and I am grateful that I have people like Stephanie and Lynnette from whom to draw strength and learn less-controlling ways to interact with hospital staff. Their examples of fortitude in the face of a mother’s nightmare gives me the encouragement I need to be a strong and effective advocate for Ashley during her surgery and recovery, and to care for the rest of my family as well. We’re a group of exhausted, drained, and perhaps cranky mothers. But we will do everything we can for our children and our families. And I hope that by our examples other mothers can also find the strength they need in times of extreme stress. Being a mother continues to be the hardest thing I have ever done in my life, but I wouldn’t change one second of the time I have shared with all my children. Do you remember career days from elementary and middle school? I believe in high school similar events are called career fairs. People with all different types of jobs are brought in to share their experiences with the students with the hope of exposing those students to the many options for their employment futures. I think it is a great idea to encourage the students to explore career choices and hopefully find the one(s) that interest them the most. That’s what most adults want for children – happy, fulfilling careers. Unless the child has significant disabilities. My children with significant disabilities are not included in career days or career fairs. Sure, they have “transition” meetings when they reach their late teens – meetings at which a group of adults discuss what the future holds for the child with disabilities. But even at those meetings, the children are not asked what they would like to do as adults. (Yes, yes, I know IDEA 2004 requires that children participate in their transition meetings and that they be asked what their interests are – but let’s get real. How often does that really happen?). During the elementary school years, children with significant disabilities begin learning functional skills – that translates into hand washing, toileting, and eating. Along comes middle and high school, and those functional skills begin to include things designed to prepare the child for employment. The problem is the children are not asked along the way what type of employment interests them. They are not exposed to options as are children without disabilities. They are merely taught to sort, collate and assemble things like toothbrush holders. I don’t know about you, but if I had had to spend my entire adult life putting the two ends of toothbrush holders together, “going postal” would take on new meaning. Would it be so difficult to discuss with the child that has significant disabilities what really interests them? If the child’s communication system is lacking (and yes, I am assuming that the children have some sort of formal communication system BECAUSE IF THE SCHOOL SYSTEM IS DOING THEIR JOB, the children will), how about observing what activities make them the happiest, and then translating that into possible employment opportunities? For example, my Ashley loves plants and flowers. Why not turn that love into a career option by teaching her to care for plants? She could then work in a greenhouse or florist. Yes, I think the next soapbox onto which I step will involve career choices for people with significant disabilities. I need to work on this before Ashley enters the job force. Otherwise, she will rip up and burn all those papers you had her collate for stuffing into envelopes, or she will tell you just where to stick all those toothbrush holders you have had her assembling. Susan of Disabled Soap Box tagged me on a post I wrote a few days ago. Here are the rules. Let others know who tagged you. Players should tag 8 other people and notify them they have been tagged. I like my spice cabinet organized in alphabetical order, no water spots on any faucet in my house, and the gas tank in my car never less than half full. My life’s motto is “OCD Works for Me”. I know Moms are not supposed to love one of their kids more than the others, but I do. I’m just not telling you which one. The beach is my favorite place in the entire world. I have a twin brother, and no, we are not identical. I have been in the same job in the computer industry for 22 years now. I can’t wait to retire and become a full time disability advocate. I was in love with Herman of Herman and the Hermits when I was a teenager. Hearing his songs today still makes my heart skip a beat. I have rheumatoid arthritis, lupus, and am in remission from non-hodgkins lymphoma. Every day without pain is a celebration. Now the hard part. I'm supposed to tag 8 other people and I'm not going to do that. It's a little 'chain letter'ish to me and I don't want to impose this on anyone else. Please don't misunderstand me, I enjoyed being tagged and enjoyed writing this list, but others may not. So, here's what I'm going to do. I unoffically tag all other bloggers who read this list. I'd like you to play if you want and just put your blog address in the responses. Then we can all come visit you and read your list. It's fiddling with the rules. But ain't that what rules are for? Why do most people say “awww, poor thing” when I tell them of Ashley’s disabilities? I admit that when I list all her issues, it might seem like she has a daunting job just existing each day. But I honestly don’t believe, and I think Ashley would agree with this assessment, that her life is anything requiring pity. She has learned to adapt her world to accommodate her disabilities, and she is doing a fine job, thank you very much, of living life her way. Ashley likes people who challenge her. The one word that absolutely does not describe Ashley is compliant. Does that mean that being her mother, her aide, her siblings, or her friends is a difficult job sometimes? Yes, indeed. Does it mean any of us would have her any other way? Definitely not. Ashley’s strong will, her stubbornness and her refusal to comply without questioning is what has helped her reach the heights she has already reached in her somewhat difficult life. And she’s not through yet. Ashley is a person who is going to challenge life head on. She was a hard to handle toddler, an energetic and enthusiastic elementary age child, and she is now a tough to deal with teenager. But she is also beautiful and exciting and a hoot to be around. She keeps her teachers and her caregivers on their toes constantly, but life around her is never dull. At the end of each day, we are all exhausted from living in Ashley’s world, but we all go to sleep with smiles on our faces. Have you noticed that a great many children and adults with significant disabilities have dental issues? Teeth that are horribly crooked – bite problems – chewing problems. Many if not most of these issues could be solved with braces, but I never have seen a child with significant disabilities with braces. Why is that? Braces for children who are not disabled have become almost as common as childhood immunizations. I can’t think of any friend of my non-disabled son who has not had braces, and sometimes braces twice. My son has had braces twice. His dentist referred us to an orthodontist very early on. The first set of braces was designed to make my son’s mouth a little larger so that his permanent teeth would have room to erupt. The second set was to ensure straight, near-perfect teeth. And his orthodontist succeeded with his efforts. My son’s smile is absolutely beautiful now. When Corey joined our family, it was obvious that he also needed braces. However, since he was my fourth child, finding the money for braces on a single parent’s salary was impossible. Fortunately, I was able to convince his grandparents to pay for his braces. And now, he is well on his way to a beautiful smile also. Today Ashley visited the dentist. Not only does she have a large gap between her two front teeth, she also has had teeth erupt in the wrong locations, e.g. a molar-type tooth in front of an eye tooth. As a result of this, she often bites the inside of her cheek, and she is reluctant to try foods that would need a lot of chewing – meat for instance. The dentist told me today that he would be referring us to an orthodontist but not to expect Medicaid (Ashley’s insurance) to pay for them. Medicaid, he said, only pays for braces in extreme situations and Ashley wouldn’t qualify. There is no way I would be able to come up with the money for her braces. So, she joins the ranks of other children with significant disabilities who endure dental problems their whole lives. I don’t understand the reasoning behind this. The cost of addressing Ashley’s cheek injuries and the feeding therapy she will need will be much greater than the cost of braces. And while braces would certainly help her appearance, and subsequently her acceptance in society, that is not the primary reason I want them for her. But, I do want her to have the opportunity for the improved appearance. Do orthodontists ever do pro bono work like attorneys do? Are there any foundations or organizations that can help children like Ashley with this much needed medical service? If anyone has any information or leads I can check out, please let me know. Ashley was reluctant to get on the school bus this morning. She has very definite preferences for the type of people she likes, and the current set of bus driver/bus aide does not fall into the ‘like’ category. But like most of us, she needs to learn how to deal with people she may not like. It’s a fact a life. After an insistent nudge from me, she decided to step up to the bus and move to her seat. As is my usual custom, as soon as she stepped up, I told everyone to have a good day and turned to go back into the house. I was in the house for a few minutes gathering my work paraphernalia and saying goodbye to my oldest son. When I left the house to go to my car, I noticed the bus was still at the end of our driveway, and that the driver and aide were both standing over Ashley as she sat half in – half out of her seat. I went to the bus, waiting for the driver to open the doors (parents are usually as welcome on a school bus as the norovirus in a daycare center), and then walked up to Ashley. The aide was softly saying over and over again “Ashley, you need to slide over in your seat.” The purpose of this blog entry is not to discuss how thickheaded the aide was being – I did that earlier this week. The purpose is to share an observation about how the students were seated on the bus. Keep in mind this is “special transportation”, meaning the only kids on the bus are the ones who will be segregated into their “special classrooms” as they arrive at school. Approximately 15 children were on the bus. The thing I immediately noticed is that each one of them had their own row of seats – no child sat next to another child. What the hell is up with that? First the school district keeps my child in segregated “special” classrooms. Then they make her eat lunch, not with whom she chooses, but still with the other students in her “special” classroom. That is followed by adapted physical education, another way of saying continued segregation. And forget ever taking part in performance programs with the children who aren’t special. So, when I saw that on the bus of “special” children, segregation is taken one step further, my blood started to boil. 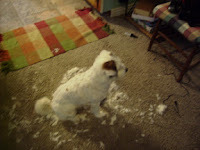 That Amy has the guts to try cutting my dog’s hair. She did a GREAT job! 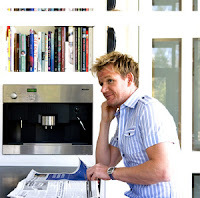 Gordon Ramsay is hot. I would sell two of my children for a chance to be on Hell’s Kitchen. OK, maybe just rent my children, but I can’t think of much I would rather do than learn to cook under his tutelage. Even though he yells obscenities and often reduces his students to quivering, crying masses, those students that survive really know how to cook at the end of his lessons. Cooking and baking are two of my favorite things to do. Were I rich and a lady of leisure, I would have a gourmet meal prepared for my family every day of the week. I really like experimenting with flavors and unique combinations of food but I like perfecting the classics equally as much. Being realistic though, as a single working mother, I can’t always spend the time I would like on preparing meals for my family. So I improvise. I search for recipes I think my family will enjoy, and then I try to adapt them to be easier to prepare. My frittatas are one example of that. A frittata is an open-faced omelet with other ingredients, such as cheese or vegetables, mixed into the eggs rather than used as a filling. I can get very creative with the fillings, using things I know my kids will eat and throwing a few new things that standing alone they probably would not choose to eat. While making a frittata is pretty easy, I have made it even easier by applying my improvising techniques to it. So, here is my plan for a very easy and healthy middle-of-the-week meal that looks like it took a lot of effort but really didn’t. The first easy modification is to use the cinnamon muffins that I made for breakfast yesterday. They will be just as tasty once they spend a few minutes in the microwave. The salad is very simple to assemble from torn green leaf lettuce leaves, cucumber slices from the fresh cucumbers in my garden, and a sprinkling of one of the salad crispy mixes you can find in the grocery store such as one with dried cranberries and spiced walnuts. Pour a little olive oil into an oven-proof skillet – I like cast iron. Dump in the cut up potatoes and bacon and warm them through. While the potatoes and bacon are warming, crack and mix together about 8-10 eggs, depending on how big your skillet is. Season the eggs with salt and pepper. Pour the eggs into the skillet on top of the potatoes and bacon BUT DO NOT STIR. The frittata must cook like an omelet, not like scrambled eggs. Sprinkle whatever fresh or dried herbs you prefer on top of the eggs. Parsley and chives are two of my favorites. Just let the egg cook – again, DO NOT STIR. The eggs will start to cook from the bottom up. As they get firmer, lay sliced Hanover tomatoes on top of the frittata. After just a couple of minutes, when the frittata is almost done, remove it from the stove, sprinkle with the cheese of your choice, and then place the whole thing into the oven under the broiler. In less than a minute, the cheese will melt and your frittata will be done. Slide it out of the skillet onto a large plate, and serve sliced like pie slices. I think even Gordon Ramsay would be impressed and would declare me his top chef of the day, take me on an incredible date in his stretch limo, and then ask me to join him in one of his 5-star kitchens. TODAY, my sweet Ashley stepped through puberty’s door and joined the ranks of women before her. She awoke this morning with a smile and a secret and seemed suddenly no longer a child. She held her head a little higher, and the look in her eyes told me she understood life would now be different. TODAY is special. TODAY I would like to call those doctors who told me she would never walk, never communicate, and should be institutionalized. TODAY I would like to contact all the school personnel who preferred to keep her segregated in a small room and refused her inclusion with the rest of the children. TODAY I want to tell everyone that spoke so certainly of her limitations that they were wrong. TODAY I want to re-introduce this beautiful and special woman that is my daughter to the world, and dare them to ever again impose limits on her. TODAY is a day of celebration. TODAY we will enjoy chocolate and chips. We will cry over silly things, and we will long for closeness one minute and need space the very next minute. TODAY Ashley takes another step in the forward direction of her life, and woe be to anyone who tries to trip her up. You have been warned. Again this morning, I had to explain to the aide on my daughter’s school bus that my daughter is deaf and blind. The explanation came after that aide said in a very helpful voice of normal speaking volume “Hi Ashley, do you need help?” The aide seemed a little annoyed when Ashley did not answer her. It’s not wholly the aide’s fault that she didn’t know about my daughter, but it sure bothers me that I have to share the same information over and over again with teachers, bus drivers, school aides, and medical facility personnel. Ashley has been a student in the same school district for 10 years now. She has also seen the same doctors and been to the same hospitals for 10 years also. Isn’t the fact that she is deaf and blind written in her records? What is the point of maintaining all the records that school and medical offices maintain if no one ever refers to their contents? 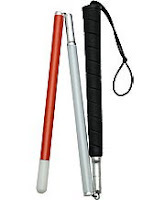 And, in Ashley’s case, it’s pretty obvious that she is visually impaired – her white cane is a tip off. I understand that it would be more difficult to figure out that Ashley is deaf, but when either I or her intervener is with her and we are using sign language, that is a clue. I have no problem explaining Ashley’s disabilities to someone new meeting her for the first time. I also don’t mind talking about the source of her disabilities or what adaptations and modifications need to be made for her to participate fully in society. But, I don’t think I should have to explain to people in our school district or medical facilities we have frequented for many years. Maybe I could use the same response that is often used in the computer industry (my area of employment) when certain people ask questions about every little thing – RTFM (Read The F*&%$# Manual). In my 47th ranked state (in services provided to people with disabilities), it seems that most children and adults with developmental disabilities love going bowling and to the mall. The love of those two places starts early – grade school ‘community based instruction’ almost always involves a trip to either a bowling alley or a local mall. As children grow into adulthood, the pattern is the same. Go to a local mall almost any day of the week around lunchtime, and you will see groups of adults with developmental disabilities seated in a special section of the mall food court. Their ‘staff’ will be with them but usually seated at another table. Since these two trips got their start as ‘community based instruction’, in what subjects are the children being instructed, and why do the adults still need instruction? Bowling is not something my family does for recreation. I have no problem with people who do like to bowl, but it seems a little strange to require my child with developmental disabilities to engage in a pastime that she will more than likely never do outside the school day. And, my oldest child, who has no developmental disabilities, wonders why his sister gets to go bowling frequently on school time and he has to study and take tests. I don’t have a good answer for him. Trips to the mall are very similar to the bowling trips for my school-aged child. I’m really not sure in what subjects she will be instructed during the trip, but I do know that the teachers usually have time to get their errands done. Perhaps they are teaching my child how to be helpful and carry shopping bags. Or perhaps, they are instructing her on how to make unhealthy lunch choices from the mall food court. Since there are no tests administered at the end of the day or week on subjects taught while bowling or malling, I’m not sure whether or not my daughter is making progress in this area. But then again, maybe that is why the practice needs to continue into adulthood for people with developmental disabilities. What about visiting a museum? What about a trip to a zoo or a local radio or television station? How about discovering the life cycle of plants and perhaps preparing my child for future employment by visiting a nursery? Or, another good choice for future employment could be encouraged by touring a local manufacturing plant? A meal at a nice restaurant would be a good place to practice manners, or a trip to a local park or playground would be a great way to work off some extra energy. For the adults, how about a concert, a trip to a retirement community or the library or local bookstore? Or better yet, why not ask the children and the adults what they would like to do? I think we might find that people with developmental disabilities do not love bowling and malling as much as some people may believe. Ahh, but maybe that’s the reason they will never be asked. Ever wonder what goes on while you are at work and your kids are home on summer break from school AND THEY KNOW WHERE THE HAIR CLIPPERS ARE? Balanced Reporting - What a Concept! I must say I'm impressed. Of course, since I live in a state that is ranked 47th out of 50 in services to people with disabilities (Virginia), it doesn't take much to impress me. I wonder if I can sell this concept to my local ABC station...?? I certainly applaud Walgreens for this effort and hope they will be a model for other companies. I do have to wonder if Walgreens would be making such a strong effort were it not for the fact that the son of the senior vice president had autism. Would the company have been so progressive if no one at the top had a life touched by disability? When we move to the next level, when companies do something similar because it is the right thing to do and not just a response to a personal involvement, then real progress will have been made. One of the many things I really enjoy about the internet, and blogs in particular, is how I come to see issues from many different perspectives. Bloggers like Dave Hingsburger and Ballastexistenz frequently help me view disability issues in a new light. Today I came across another blogger who has written about self-stimming behavior. 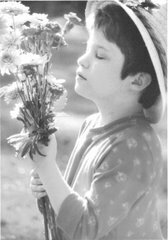 While the author, Joel Smith, discusses this behavior from the point of view of a person with autism, his comments and insight are very applicable to a person like Ashley with deafblindness. 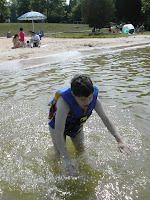 Take a look at his blog entry, Regression and Stimming on his site, "NT's are Weird, An Autistic's View of the World. As a result of reading this entry, I will now look differently and more deeply into understanding Ashley's self-stim behaviors. Where is Elmer Fudd When You Need Him? I planted a beautiful vegetable and herb garden this year. It has exactly what I like (cucumbers, squash, tomatoes, peppers, parsley, oregano, basil and mint) and nothing I don’t like (brussel sprouts, beans, okra, and asparagus). I baby the garden trying to find the exact right fertilizer mix, watering just enough but not too much, and making sure it is in a location that gets the right amount of sunlight. But even with all that, there is still something that is threatening my vegetable bounty this year, and I am really angry. Rabbits. Lots of rabbits. A really big daddy rabbit, a medium sized mommy rabbit, and LOTS of hungry little baby rabbits. They have no shame. They will sit and munch for hours on end, and will only hop away when I come storming out the back door, yelling ‘SHOO’ at the top of my lungs. At the risk of having PETA picketing outside my front door, if my county allowed me shoot the furry ravenous creatures, I would. Or maybe poison them, although that might also put our pets at risk. I’ve also considered a Havaheart trap – one of those little metal cage things in which you put food to lure the pests, and then when they take a bite, a door slams shuts on their little cottontails. Then I found out that even if I trap them, there is a law that prevents me from taking them to a new home. Supposedly that law is to keep people from introducing a rabbit disease into a new area. So what? – I just get to keep the diseased rabbits in my yard? I do have a Jack Russell Terrier that in her better days could probably have given the rabbits a run for their money. But now, her vision and hearing are so bad that the only way she would locate a rabbit is if she tripped over one. So, what am I left with? A fence has been suggested. Well, maybe next year, but this year all the gardening funds have already been spent. The only other thing I am aware of and have tried is hot pepper wax spray. It’s a product that comes in a squirt bottle, and I am supposed to spray it on the vegetables and herbs AND remember to wash it off really, really well before serving anything to my family. That spray has afforded a small bit of protection. Now the rabbits only take one bite of a vegetable before deciding it doesn’t taste good. But, because rabbits are not the smartest creatures in the world, they then move on to the next zucchini or tomato or pepper to try it. So, instead of having all the vegetables in my garden eaten, I only have one bite out of all my vegetables. Is this progress? Where is Elmer Fudd when you need him? Or those Trix kids who always get the cereal away from their pesky rabbit?